This morning I did my third common bird census (CBC) visit to Druridge. It was a cold start but soon brightened up and got warmer, the strengthening westerly wind meant I had the best of the day. It was pretty quiet though, with very few migrants about, three singing willow warblers were mapped quite soon into the visit. I was out on the old haul road when things got a little bit more exciting, firstly two whimbrel flew north calling, then I noticed a skylark chasing another bird, which turned out to be a lapland bunting. It was certainly not a species I was expecting in mid-April, I had to do a double take, thankfully it posed for piccies for a short while. 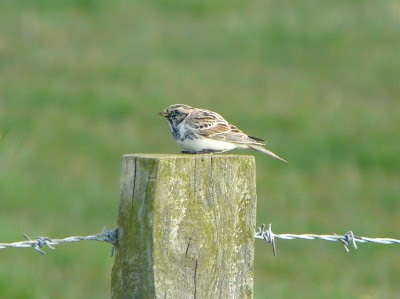 I bet there aren't many lapland buntings seen in Northumberland this late. Another nice bonus was three black-tailed godwits on the Budge fields. By the time I got the survey finished I met up with ADMc and Roger Foster (bemoaning the surrender of his pager), a couple of swallows and some sand martins were moving through, no house martins yet though, Andy also picked a very high buzzard overhead. It was also interesting to see how many shelduck are about at the moment, six were on the grass when I arrived and few were out in the dunes later. A couple flew over 'laughing' at me on the haul road - they weren't watching a lap bunting though. 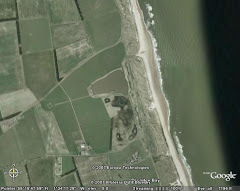 Tomorrow is WeBS day so I'll have to go back to Druridge - Damn! Nice record. Lucky it stayed on that post long enough to get that pic. Nearly all my sightings are in the air calling. Never had an April bird.